Sims Cove Exquisite Villas have been carefully sited within a surrounding diverse nature preserve including the wooded valley of Chicopee Creek, upland forest and wetland. 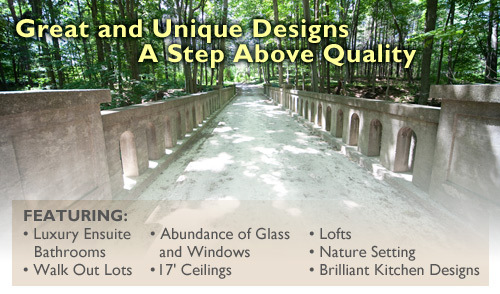 Each site features a walk out lot backing on to the Chicopee Creek ravine featuring a historic stone bridge. Great care has bee taken to integrate the property within its natural settings as well as preserve the site’s cultural heritage and historic features. Capital Homes proudly presents a secluded commune of exceptional villas reflecting timeless design principals.